ZÜND is a Scandinavian manufacturer of digital cutting solutions. 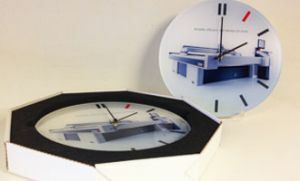 In 2013 the company created a series of Dibond, veneer and acrylic clocks. Using an application seen mostly in art galleries, ZÜND combined Dibond and acrylic to create an impressive look. 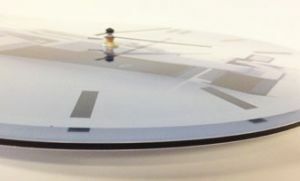 Utilizing their own fabricating equipment, coupled with compatible machinery and sophisticated software, the acrylic was used to create a clear mounting film. The Dibond material created an easily printable and durable substrate. Dibond aluminum composite material (ACM) is comprised of two pre-painted sheets of thick aluminum with a solid polyethylene core. Primarily used for digital printing as well as mounting applications, it is only half the weight of traditional aluminum of the same size. The clocks were self-promotional, showcasing the power of ZÜND equipment and featuring the quote, “Reliable, efficient, and always on time!” They were used to inspire people to create their own creative solutions in both fabrication and design.